Narrator: Around and around she goes, and where she stops, nobody knows. All Ed Lindsay knows is that he desperately wanted a second chance, and he finally got it - through a strange and wonderful time machine called a radio - in The Twilight Zone. I remember my grandparents had one of those big console radios in their living room during the 50s when I was a little kid that is the object of this Twilight Zone story. It would be worth a fortune on today's market providing you could find parts to make it work. I remember it wasn't until the middle 50s that they got television. The radio age in the USA was from the end of World War I until the end of World War II and it was an age of imagination because you heard the words and visualized the people all in your mind. It was an age that Dean Jagger grew up in and apparently let some chances pass him by back in the day. So one is at the boardinghouse he stays in now and when others use it all they get is static. But when he uses it he gets things like Major Bowes Amateur Hour and a broadcast of Tommy Dorsey playing his theme I'm Getting Sentimental Over You. As there is a spinster woman played by Carmen Matthews also at the boardinghouse whom he might have married Jagger truly is getting sentimental. 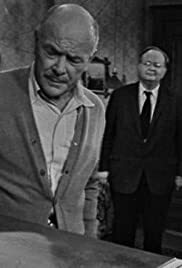 This was a really fine Twilight Zone episode where only in a place like the Twilight Zone do you get a do over in life.